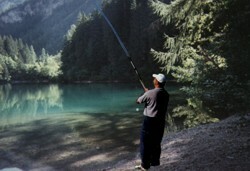 TOVEL Lake, as all the other lakes and rivers in the Adamello-Brenta Natural Park, represents an ideal place for everyone who wants to go fishing. 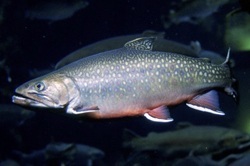 The trout and the Artic char represent the predominant species of this area. People have to remember that for this kind of acticity it’s necessary to have a FISHING LICENCE and to buy a daily or annual fishing permit. The LAGO ROSSO hotel sells both fishing licences and permits..
For the Artic char and for the trout , people are allowed to fish up to 5 head per day per fisherman. The ARTIC CHAR and the trout are similar for their tapering shape, that is slightly compressed; while the lateral side of their body is somewhat round and their head is more massive. The muzzle is rounded and it has a wide mouth with curved teeth disposed on the jaws and on the tongue. The colour is quite uniform, tending to brown or lead gray and the sides are clearer with circular spots. During the spawing period, the belly of male, especially, got a bright red colour, while the edges of the fins become red and white. It can reach a maximum length of 60 cm and a weight of 3 Kg. Here, an adult Artic char does’t exceed a 20 cm length and 150 gr of weight. In the Tovel Lake people can also find bigger specimens. Their diet consists in aquatic insects, zooplankton, crustaceans in general and small fishes. The Artic char prefers the cold and deep waters of the mountain lakes situated at high altitude (with temperatures always above 18°C). The period of reproduction is in the late autumn. The body of the TROUT is taped, slender, slighly compressed; the head has a conical shape, the mouth is big; it’s in a terminal position and it’s sligthly angled upward. Its habitat: people can find this species in Alpine streams or lakes, where the waters has a lot of oxygen and where the temperature is always lower than 15°C. Thanks to its fast level of adaptation , it can also live well in the bigger and pire rivers of the plains. Its hydrodynamic and strong body allows the trout to go against the tide for long traits; it shares this characteristic with all the other salmonids. 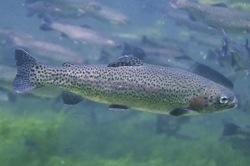 People can divided the species of the trout into different subfamilies: such as rainbow trout or the fario. This kind of fish eats aquatic insects and larvae and it performs spectaculars jumps to catch flies and butterflies and the biggest ones of this species become predators, in fact they eat small fishes. The trout reproduces itself in November and in January in low gravelly bottoms.In this period the male presents a darker colour and its abdomen is more or less black. If you want to catch an artic char, we can suggest you the following tecnique: you can use a moving float with a lightweight frame, a terminal with a dimension that can go from 10 to 16 and a hook of 14. The mooving float (light weight) is recommended because the char is a fish of bottom, so it’s better to calibrate teh depth by placing the bait a few centimetres from the bottom, in order to avoid to remain loaning. The recommended baits are the honey camola and the “bigattini” or larva of Carnaria fly. ovel Lake is a good place also for people who love spinning; in fact they can get good results with this tecnique.